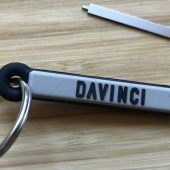 Several years ago, I reviewed the DaVinci Ascent Vaporizer. I found it to be extremely well made and easy to operate. 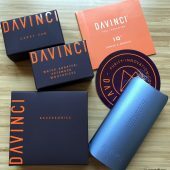 The DaVinci IQ Precision Vaporizer is their newest offering; it’s all that the Ascent was and more. 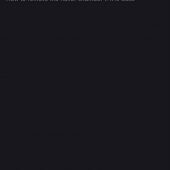 Sleek, easy to operate, solidly made, and now it can be controlled by a connected app. 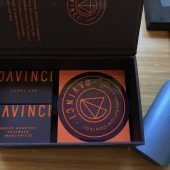 Opening a DaVinci Vaporizer box is a premium experience; although the box is small, it is packed tightly with accessories, each of them thoughtful and well made. 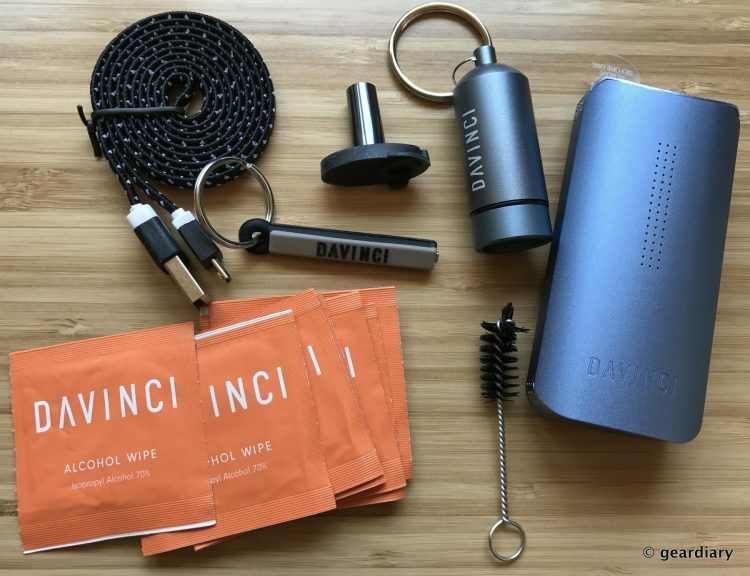 Included in the box are the DaVinci IQ, a carry can, a premium USB to micro USB charging cable, a chimney brush, a key chain tool, alcohol wipes, a 10mm mouthpiece adapter, a DaVinci sticker, and an owner’s manual. 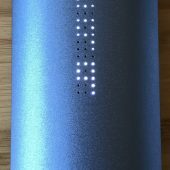 I like that with the IQ, DaVinci moved away from the proprietary charger the Ascent used, although I can’t help thinking that if they had used a Type-C charger, this vaporizer would have been solidly future-proofed. Ah well. At its widest points, the DaVinci IQ measures 3.6″ long by 1.7″ wide by 1′ thick, and it weighs 5.2 ounces. 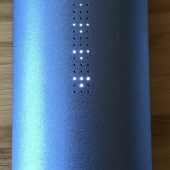 Its body is composed of aluminum; there are 51 dots cut into its face, and they illuminate with LEDs to display various functions. 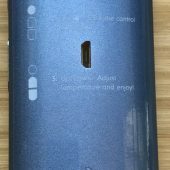 On the right side, there is a Control button and a Smart Path/Temperature rocker button. 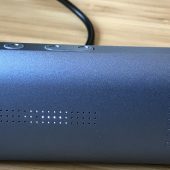 Pressing the Control button five times will power on the vaporizer; clicking it once (after it’s been turned on) will switch heating modes, and clicking it five times again will turn it off. 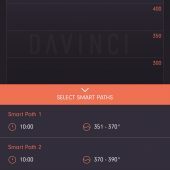 Depending upon the mode you are in, clicking the rocker button will either change your Smart Path (I’ll explain those in a bit) or it will change the temperature. 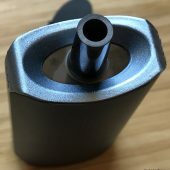 The left side is plain, but at the top and bottom, you can see the dimpled grips for opening the top and bottom of the vaporizer. 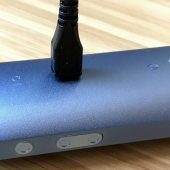 The back of the IQ has the micro USB charging port. 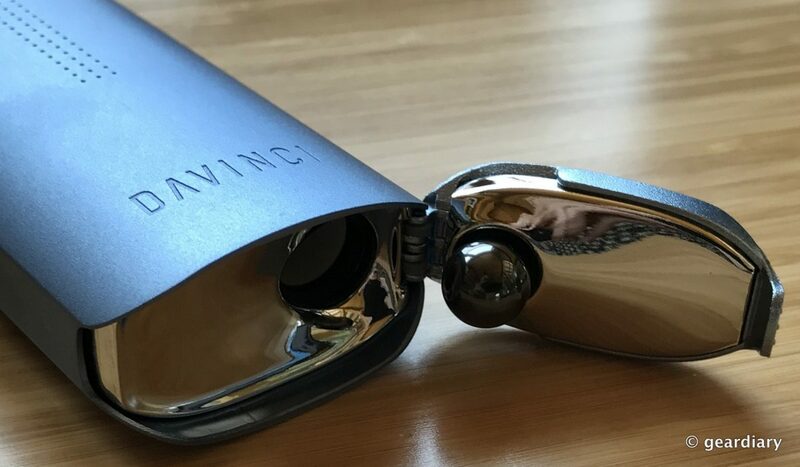 The DaVinci IQ comes with a low-profile mouthpiece installed; it is composed of 100% ceramic zirconia, which DaVinci says “allows the user to draw out the purest flavor you’ll ever taste from a vaporizer.” I’m not going to argue with that. 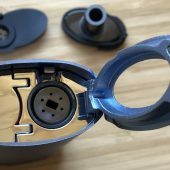 The low-profile mouthpiece uses a silicone base to hold it in place inside the lid of the IQ, but there is also an included 10mm water adapter/extended mouthpiece that can be inserted in the same slot. 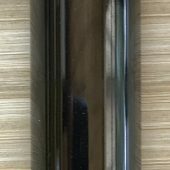 This optional mouthpiece is also made of ceramic with a silicone base. 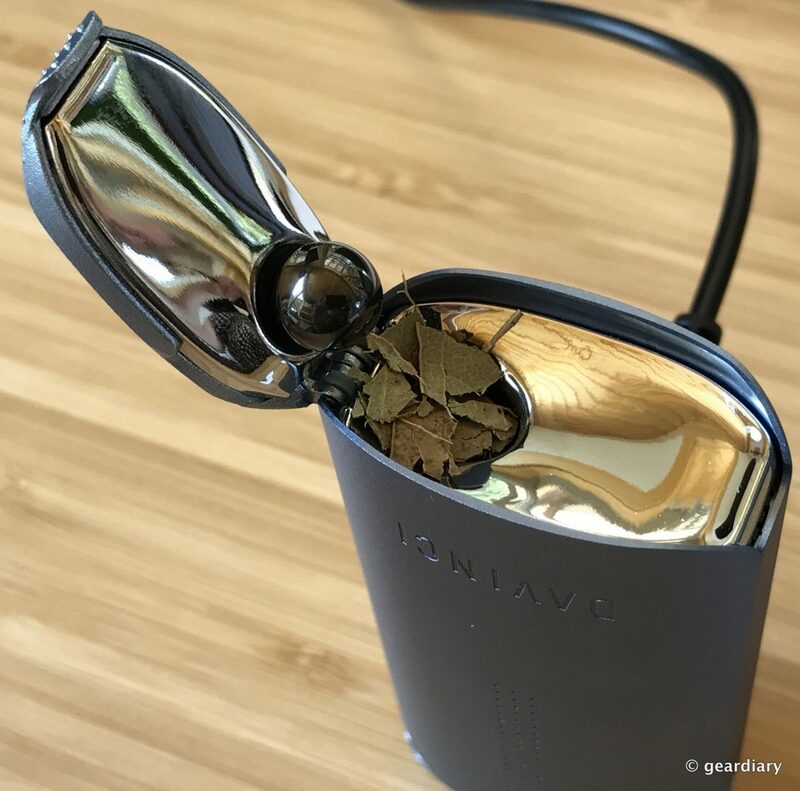 Directly under the mouthpiece, there is a removable ceramic flavor chamber that you can use to either add additional herbs for a multi-layered infused flavor, or you can use it as additional storage. Anything that’s in this chamber will have air going through it when you draw on the mouthpiece, but it will not be cooked, so to speak. 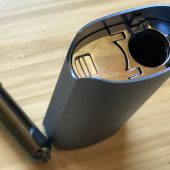 A handy tool is stored on the side of the inner chamber that can be used to remove the lid of the flavor chamber. 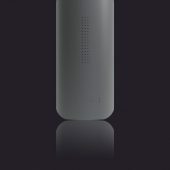 The rechargeable and replaceable 18650mAh battery is stored in its own compartment under a locking metal door. 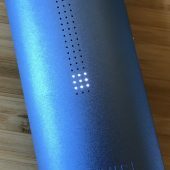 When you are charging the DaVinci IQ, a battery icon will light up on the LED display, showing blinking lights as the battery fills. 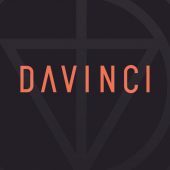 Once the vaporizer has been charged, it’s a good time to download the DaVinci app. 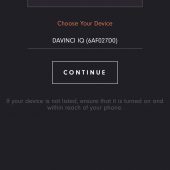 If the IQ is turned on, the app will recognize the vaporizer, and you’ll have an opportunity to give the vaporizer a name and create an account with DaVinci. 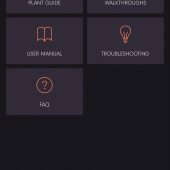 With the app, you can control temperatures and smart paths, and there are a lot of other features built-in, such as a user manual, walk-throughs that show you how to use the IQ’s various features, an FAQ, a troubleshooting guide, and a plant guide which shows information on various smokable herbs. 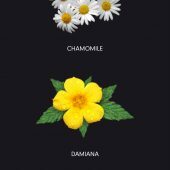 My herb of choice at the moment is eucalyptus, but other included herbs in the guide include chamomile, damiana, passion flower, green tea, peppermint, raspberry leaf, lavender (another fave of mine), lemon balm, St. John’s wort, wild lettuce (you can smoke that? Who knew?! 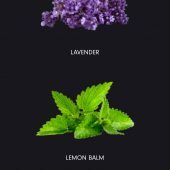 ), rosemary, jasmine blossoms, cloves, orange blossoms, kola nuts, maca root, ginseng, thyme, and basil. All that’s left is to load the smoking chamber, which is located on the bottom of the vaporizer. 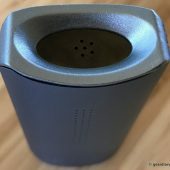 The door swings open, and there is a large Zirconium insulative spacer ball at the bottom that not only packs the loaded herbs, it does nothing to change their taste. 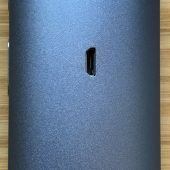 Ideally, you’d grind whatever material you planned on vaping, but I found that loose eucalyptus leaves packed tightly worked just fine. 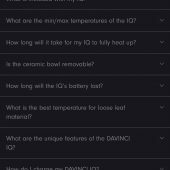 The app is completely worth downloading because it will not only allow you to control the vaporizer’s temperature and learn more about your vaporizer and how to use and clean it, the app is also necessary if you’d like to create Smart Paths. 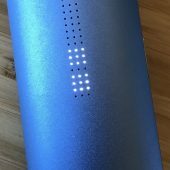 A Smart Path is a temperature range that the IQ will heat between for the perfect vaping experience. 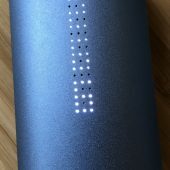 Smart Path One has a start temperature of 350ºF and an end temperature of 370º. Smart Path Two has a start temp. 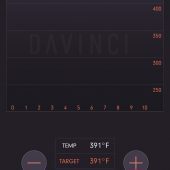 of 370º and an end temp. of 390º. 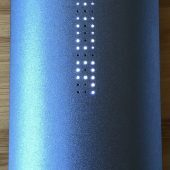 Smart Path Three has a start temp. of 390º and an end temp. 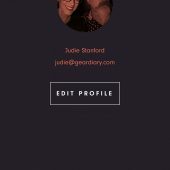 of 410). 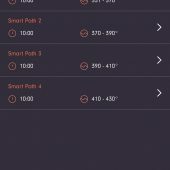 Smart Path Four has a start temp. of 410º and an end temp. of 430º. You can also select a precision temperature if you know which one you’d like to use for the particular herb you are vaping. 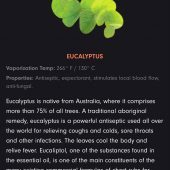 For instance, eucalyptus is best vaped at 266ºF. 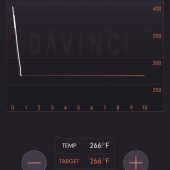 You can either set the temperature through the app, or you can adjust the temperature down by pressing the rocker button on the vape. 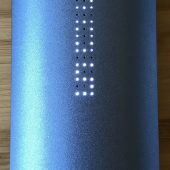 It can take anywhere from 45-60 seconds for the IQ to fully heat up to your chosen Smart Path or temperature. 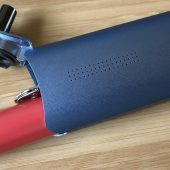 When you are vaping, you can press and hold the Control button to activate Boost Mode; doing this keeps the vape at max temperature. 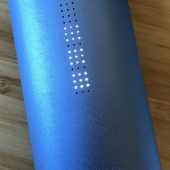 You can release Boost Mode to enter standby mode, which allows the vape to cool down and conserve your herb; pressing any button on the vaporizer will resume the temperature you’d set. After you’ve smoked your chosen herbs, the chamber is easily cleaned by using the included chimney brush to sweep out the inside of the bowl. You can use a Q-tip dipped in isopropyl alcohol to swab the inside of the bowl. 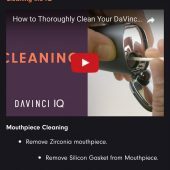 The app will tell you how to clean all of the other components. 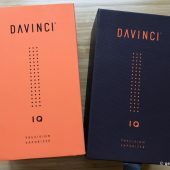 One major difference between the DaVinci IQ and the Ascent is that the Ascent had a glass insert that could be used to vape essential oils; the IQ does not have that feature, but it has a different trick: It can be connected to a water pipe. I don’t have a water pipe, but according to the IQ walk through for this, to do this, you’ll use the 10mm adapter/extended mouthpiece. 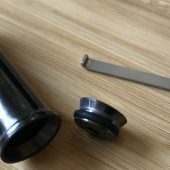 “First open the top gasket of your IQ and remove the flat mouthpiece and gasket. 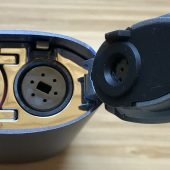 Insert the 10mm adapter with gasket into the top cap. Make sure to secure the gasket firmly to avoid any air leaks. 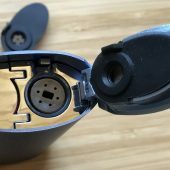 Once you have installed your adapter close the top cap and insert the 10mm adapter into your favorite water pipe and enjoy.” Seems like a lot of extra work, but okay. 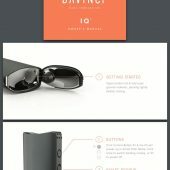 The DaVinci IQ’s battery will last for about 90 minutes of use depending upon the temperature setting you use. 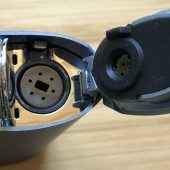 This seems a little short, but since the vaporizer uses micro USB to charge and you can use the vaporizer while it’s plugged in, it’s workable. 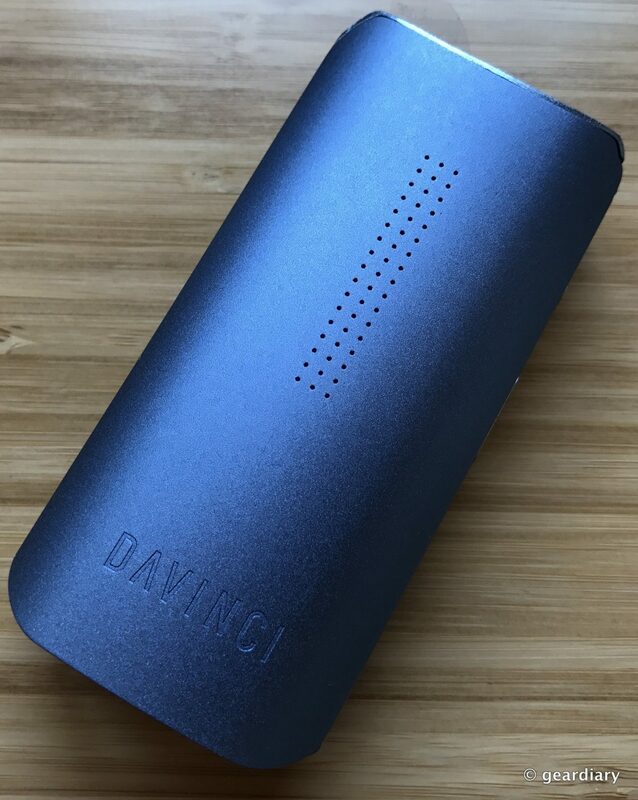 The DaVinci IQ will get warm as it is used, but it’s not hot; it’s a comforting warm, like holding a warm cup of tea. 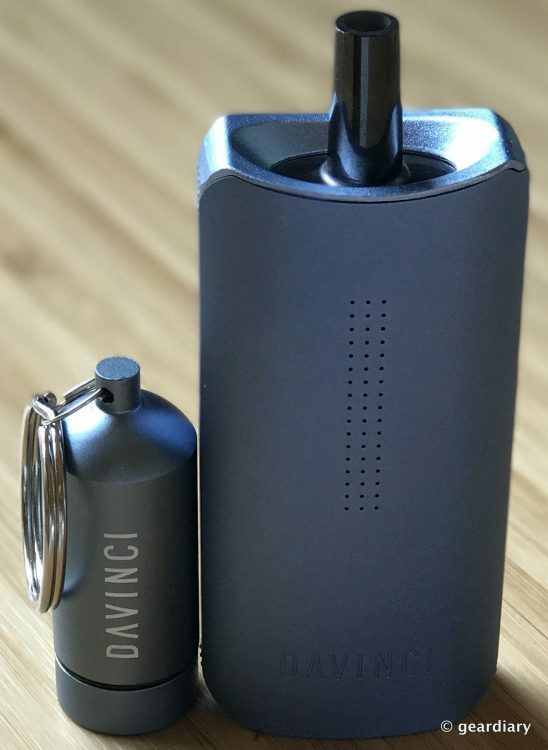 I’m really enjoying the DaVinci IQ; it is one solidly built little powerhouse. 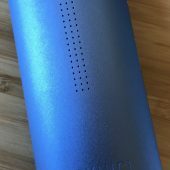 The vapor that it produces is smooth and enjoyable, and temperatures are easily managed. 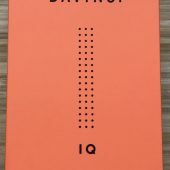 The connected app makes the IQ extremely customizable. 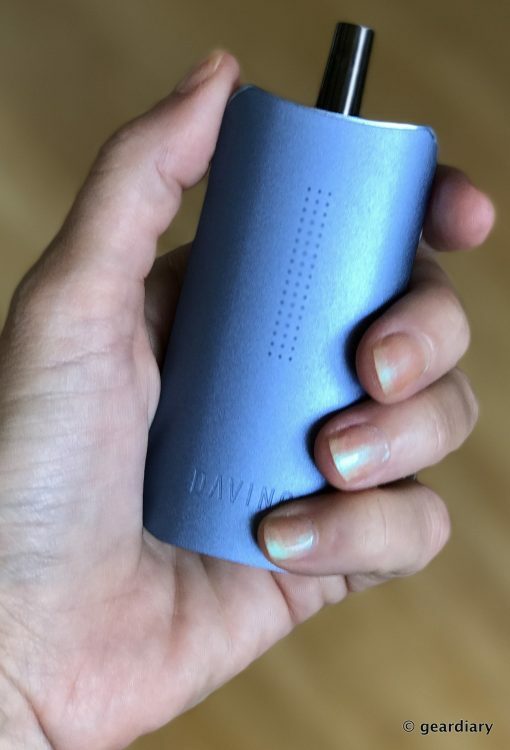 If you are looking for a well made, easy to operate, easily pocketable and discreet vaporizer that produces a smooth, enjoyable vaping experience, look no further than the DaVinci IQ. 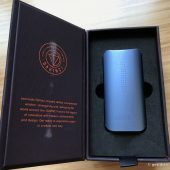 The DaVinci IQ Vaporizer retails for $274.99, and it is available directly from the manufacturer and from other retailers.